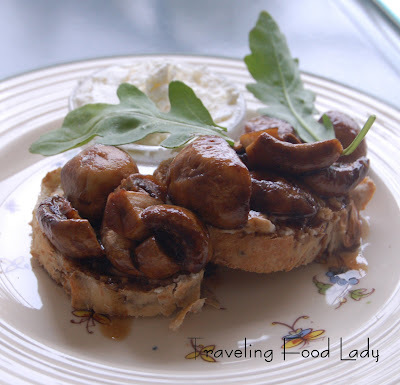 Here is a very special "Aussie" recipe and easy appetizer, especially if you are fond of mushrooms~and goat cheese! The flavor lingers long after the last bite! Place the mushrooms, sugar, oil and vinegar in a small bowl and toss until well coated. Place and cook in a non-stick frying pan for about 10 minutes. Keep stirring until the sauce begins to caramelize. 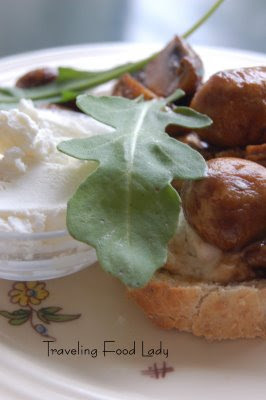 Spread the goat chesse on the thinly sliced baguette and top with mushrooms and arugula. Now invite some friends over for a bite and glass of chilled white wine! Enjoy! Hi Jann - that looks SO scrumptious, earthy and delicious! Hope all is well with you! I love mushrooms and also goat cheese, so I would love some of your mushrooms. I know it is hard to believe, but this afternoon, as I was riding my bike, I thought about you, because I just finalized our plans to be in Italy at about the same time as last year. Do you have any plans to travel to Italy in October? T.W. ~ Thanks for visitng... .this was delicious and so easy!Take care! K&SThank you for visitng. Need to get back over to see what everyone else has been cooking up this summer! 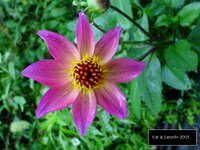 Simona~ How very nice to hear from you! I can't believe how much time has passed since I last posted. I just came back from IT~I thought of you also and what a fun time we had meeting up with you in Cortona~Are you going back to the same areas? Oooooh! I'm saving this one. Beautiful presentation, Jann. And the ingredients - I would lack for nothing! Ditto! The presentation is lovely and I expect to try the recipe very soon! Delights From The Chianti Region!